3D printing could help the asteroid-mining industry get off the ground. Billionaire-backed asteroid-mining company Planetary Resources is teaming up with 3D Systems, whose 3D printing technology will help craft components for the Arkyd line of prospecting spacecraft, officials announced Wednesday (June 26). "We are excited to work very closely with Planetary Resources’ engineering team to use advanced 3D printing and manufacturing technologies to increase functionality while decreasing the cost of their Arkyd spacecraft," 3D Systems CEO Avi Reichental said in a statement. "In success, we will create the smartphone of spacecraft and transform what has been an old-style, labor-intensive process into something very scalable and affordable that will democratize access to space, the data collected from space and off-Earth resources for scientists and the public," Reichental added. Planetary Resources co-founder Peter Diamandis said that the use of 3D printing in the production of the Arkyd spacecraft series could help the company achieve its lofty goals. "We are absolutely thrilled to partner with 3D Systems, the world’s pioneer and leader in 3D printing and advanced manufacturing, as we pursue our vision to expand the resource base beyond Earth," Diamandis said in a statement. "3D Systems has a long history of inventing, advancing and democratizing manufacturing – and our vision of mass producing the Arkyd 100, 200 and 300 line will greatly benefit from their thinking and technology." Planetary Resources officials hope to launch a series of robotic spacecraft into Earth orbit and, eventually, to near-Earth asteroids in order to mine them for resources such as precious metals and water. The company, which counts Google execs Larry Page and Eric Schmidt among its investors, hopes its efforts help open up the solar system to further human exploration. 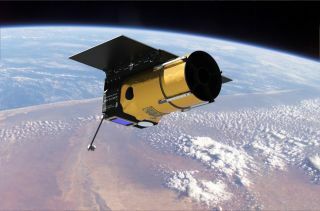 The Arkyd 200 and 300 spacecraft will be able to both search for asteroids and fly toward promising targets for closer inspections. Once an asteroid is spotted, Planetary Resources plans to send a group of about five Arkyds out to the space rock, Diamandis said during a recent Google+ Hangout. The Arkyd 100, on the other hand, will scout for space rocks from Earth orbit. The first Arkyd 100 is expected to launch in 2015. Planetary Resources has pledged to make one of these satellites the first publicly accessible space telescope ever sent into orbit. The telescope will search for asteroids and take "space-selfies" crafted from user-submitted photos. Nearly 15,000 people have contributed more than $1.2 million to help build Planetary Resources' Arkyd 100 through the crowdfunding website Kickstarter. Planetary Resources' Arkyd 100 Kickstarter campaign ends on June 30 at 10 p.m. EDT (0200 July 1 GMT). To mark the end if the Kickstarter campaign, Planetary Resources will hold a three-hour webcast Sunday beginning at 6 p.m. EDT (3 p.m. PDT/2200 GMT) to present its asteroid-mining efforts to the public. You can watch the asteroid-mining webcast live on SPACE.com here. If the campaign reaches $1.7 million, Planetary Resources has pledged to create an "Asteroid Zoo" project in cooperation with Zooniverse, a citizen-science website that helps connect the public with projects in different fields. According to the company, the Asteroid Zoo is envisioned to be "a program to allow students, citizen scientists and space enthusiasts to find potentially hazardous asteroids (PHAs) at home and help train computers to better find them in the future." "Planetary Resources values the power of the connected mind; when working together, we can accomplish much more than any of us can do alone,” Chris Lewicki, President and Chief Engineer for Planetary Resources, said in a statement. "We’re creating this program to harness the public’s interest in space and asteroid detection, while providing a very real benefit to our planet." You can learn more about Planetary Resources' Arkyd space telescope and public Kickstarter campaign here.